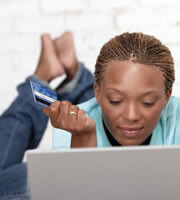 Many people turn to credit cards or loans when they don't have enough cash to purchase items they need or want. It's never a good idea to rely on credit cards for frivolous purchases, but there may be situations where you need fast cash. Two ways to get your hands on credit when you need it are credit cards and home equity lines of credit (HELOCs). Here are some of the similarities and differences between these two methods of borrowing money. Credit cards are basically unsecured loans. You swipe a piece of plastic to make purchases and sign for them. Your signature allows the purchase to be deducted from your credit line and serves as a guarantee to repay the loan. Because no collateral is involved, you won't lose any assets if you default on your agreement to pay off the credit card balance. If you own a home you may be able to qualify for a HELOC, which is a home equity line of credit. Like a credit card, the HELOC can be used any time. You can access funds with checks or a debit card. A HELOC uses your home as collateral, and is basically a second mortgage. That means that if the loan isn't repaid, you could lose your house. It is risky to borrow money with a HELOC if you aren't sure there is enough income coming in to keep up with the payments. 0 Responses to "Credit cards vs. home equity line of credit"